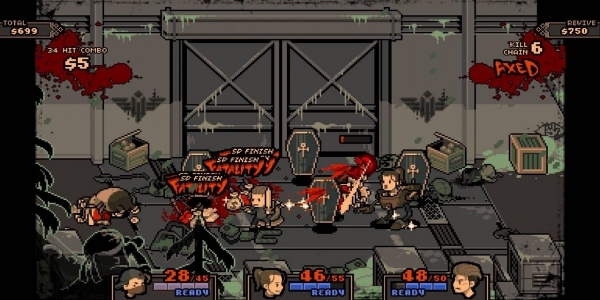 2D side scrolling beat em up arcade action has been gathering attention lately, especially with the recent release of Capcom’s Beat Em Up Bundle. As with all things that start to gain popularity, you just know someone will go and parody it. Enter Streets of Red – Devil’s Dare Deluxe. Sometimes, these parodies can be fun. However, other times they try to hard, and you end up with a game that just feels trite or hyper-critical. The question is in which of these categories does Streets of Red fall. 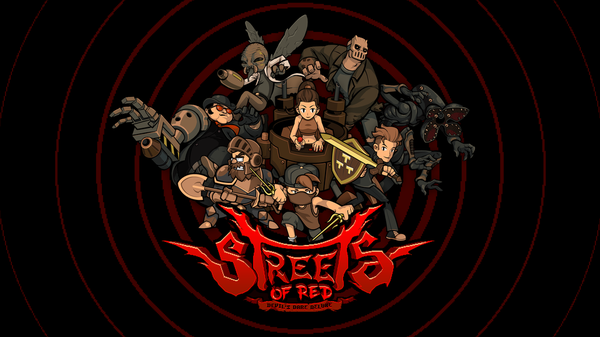 Streets of Red is a 2D side scrolling action beat em up game. It doesn’t take itself too seriously and has plenty of humor. In fact, it has as much humor as it does blood, though the gore isn’t over the top or realistic or anything. The game has a rather 90’s video game vibe in some ways, partially due to the inspiration where the cast of characters come from. Equal inspiration is the horror element, where it draws from 80’s monster movies. It was heavily influenced by games like Streets of Rage. 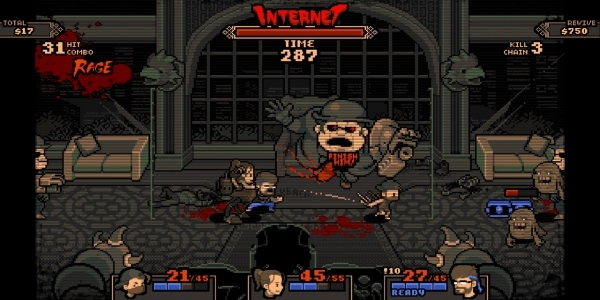 Streets of Red has two major modes: Arcade and Survival. I recommend for trying out new characters always start with survival. It’s a great way to get use to the combo moves and try to get your timing down, which is critical, with less punishing fights than playing in arcade mode. It’s just never ending waves of enemies. Surprisingly, there are quite a few enemy types in Streets of Red, which adds a nice spice of variety and replayability. Each enemy has their own move sets, and the AI is basic yet challenging. All enemy attacks have a tell before the attack goes through, so it gives you a chance to dodge roll out of the way. It’s quite nice gameplay wise. 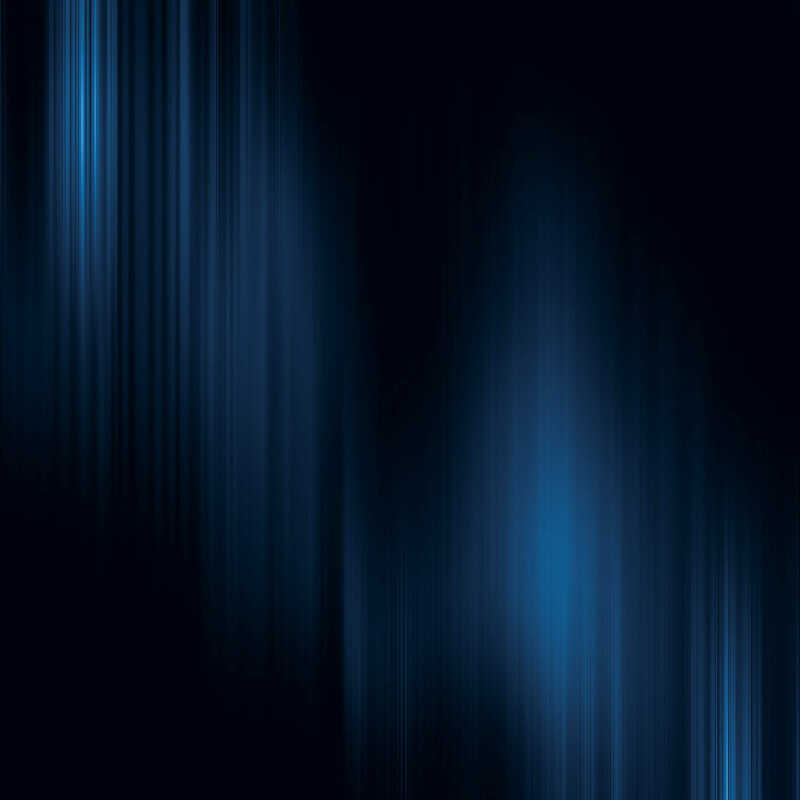 It gives you that easy to understand but difficult to master feeling. I have to say, while playing Streets of Red, I had fun and enjoyed my time in the game. I really loved the retro spoof video game characters. The 4 characters available at the start are Kingston, who is a spoof on Arthur from Ghosts and Goblins; Queenie, who is a spoof on Terra Branford from Final Fantasy VI. ; Jackson, who is a spoof on Raphael from Teenage Mutant Ninja Turtles; and Axel, who is a spoof on Link from The Legend of Zelda. There are two extra locked characters, but once you beat the base game you unlock those. Their names are Anthony and Johnathan. I’m not sure what game they come from, but while playing them, I get kind of a Contra vibe, so that’s going to be my guess. I really love the art style in Streets of Red. In some ways, the art reminds me a little bit of The Binding of Issac. You can tell the developer, Secret Base, really had a lot of passion and a desire to make a great indie game; it really shows in the final product. Another plus is the skippable cut scenes. So after you’ve watched them a few times, you never have to watch them again. You can also play the tutorial at the start of every game for extra practice, or you can choose to skip it, which I think is a clever feature. Even Jim F. Sterling Son makes an appearance in this game as one of the four major bosses. Each stage in Streets of Red has more to it than at first appearance, which adds to the replayability. If you play The Sewers first, you’ll see less of the stage than if you play it last. So the stage combinations really add a lot of variety. Also, different enemy types will appear in the stage based on what order you play them. Streets of Red also has rouge like elements embedded into the game. After each stage, you can choose to purchase upgrades to help you advance in the game, or you can save your money to buy extra lives. Run out of lives, and not only does your character die, but your save file and progression are gone as well. You can also buy a continue from the shop, but it’s random when it will appear. Sadly, Streets of Red is not without a few problems that may be troublesome to a few of our readers. 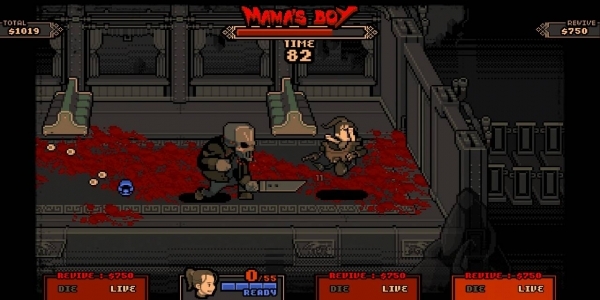 Probably the biggest problem is that there is no gore filter, so if you’re not a fan of red blood smears and dismembered corpses on the screen (granted the corpses are only briefly on the screen, but they are there), then you may not want to play this title or buy it for your children. I think the game is easy enough to understand that a child can play it; it may just not be something you want to buy for them. If you do buy Streets of Red, try not to get frustrated with the controls. the game is all about timing, and honestly it’s not the controls that are causing the issue but player input. You really have to get your timing down, and the best place to do that as stated above is survival. If you go into arcade and you don’t have the controls down to muscle memory, you’re going to have issues, and this may lead to that frustrated feeling. The game is limited as well by having local Co-Op only. I’m constantly dreaming of a world where online Co-Op comes standard in every game. Sadly we are not there yet. Streets of Red does have Local Co-Op with up to 4 players, and single joycon support available. The game can be played docked, in tabletop mode, and handheld. One thing that may scare some people away, is that Streets of Red is a game developed in the Unity engine. However, none of the assets are store bought; they are all are original. So don’t allow some of the usual trappings of it’s a Unity game scare you away. There are a few great indie Unity games out there, and this is one of them. Streets of Red is available for download on the Nintendo eShop for $7.19 USD which is kind of an odd price point, I’m not sure why it was chosen, but it’s still a relatively cheap price for all the content and replayability that is offered. This entry was posted in Post, Reviews, Switch and tagged eShop, indie, nintendo, Saint Killjoy, Secret Base, Streets of Red, Streets of Red - Devil's Dare Deluxe, Switch, Travis Patterson, Unity. Bookmark the permalink.